Permeability analysis was developed by Hillier and Hanson (The Social Logic of Space 1984) as a method for understanding how the space with in buildings is used by mapping the interconnectedness of spaces and the movement between them rather than looking at the architecture and the decoration. The space is what is the bodies inhabit, use and experience. The permeability map reveals the social organization and ideology projected on to the arrangement and connectivity of rooms. I developed this method with ideas from archaeology and performance to apply it to religious buildings and to more transient spaces created during rituals within larger rooms. My case studies were eight different faith buildings in Bristol, England; Anglican Christian, Baha’i, Buddhist, Druid, Hindu, Muslim, Reformed Jewish and Sikh. My study found a pattern to the use of space across these faiths that differed uniquely from non-religious buildings and which mirrored the ideas of Durkheim on rites of passage. A summary of the results were published in 2012, Irvine, Hanks and Weddle. ‘Sacred Architecture: Archaeological and Anthropological Perspectives.’ pp.91-118 in Archaeology and Anthropology: Past, Present and Future. ASA (Association of Social Anthropologists) monograph. Stable and accessible. Particularly when it has become architecture. Many [Turner (1987: 94), Bell (1997: 59) Merrifield (1987)] have observed that the practice of ritual is more stable and endures longer than the specific meanings attached to it. Bodies in space are essential to the experience of ritual. Many [Owoc (2001), Bell 1997, Marshall 2002, Grimes 1982)] have argued that ritual is more than the merely social or cerebral. It is also physical. Bodies in space. The space affecting the body and also the body changing the space. In particular, this has been noted by Clive Barker (the drama theorist with whom I did a number of performance workshops about space) who shows that there is…..
Firstly, I noticed that the understanding of ritual among archaeologists of prehistory in Britain was lacking in some respects. Partly this was due to them largely being outsiders when it came to ritual practice. Sometimes ideas were borrowed from other disciplines without fully understanding them. Durkheim’s idea of the liminal, for example, (which I shall return to later in this paper). This transitional state is the central phase of rites of passage, and as I found through my research, is at the centre of ritual spaces. However, the betwixt and between state of liminality was only applied by Archaeologists at boundaries and edges. So there is a gap in the understanding of the ritual spaces. Permeability analysis was an idea developed by Hillier and Hanson in ‘The Social Logic of Space’ (1984) as a methodology for looking at the spaces within a building rather than the architecture of the building. Space and freedom of movement affects people. Permeability analysis shows how strangers, visitors and inhabitants interactions are controlled/expressed by the spaces. This reveals aspects of the social organisation and ideology projected on to the arrangement and the connectivity of rooms. Marcus (1993) summarises Hillier and Hanson’s work very well. Those who have a good spatial sense such as those with dyslexia will find this easy to understand, but for those who do not have that advantage here is a simple example. “Alterations in the positions of doorways can radically change the experience of visiting a building. Building E has rings of freedom of movement, whereas D has separate branches, one with a controlled door. Both buildings have three layers of depth.” (Irvine, Hanks and Weddle 2012: 92) Changing the position of the doors can also change the distance from the outside and thus increase the number of layers of rooms; the ‘depth’ of the buildings permeability. Doorways are the point that controls the access. Marcus (1993) who applied it to a large range of building types, and he also added the aspect of inter-visibility between rooms, such as in prisons. West (1999) who applied it to the country house setting with its two distinct groups of inhabitants, illustrating how different groups can have different degrees of freedom of movement within the same building. Gould (1999) who shows how quickly the method can be applied that it can be used as part of a rapid photographic survey to record buildings prior to demolition. This is one of the techniques main virtues, there is no need for measuring and accurately planning the space. A sketch plan from a brief visit is all that is required, one is recording the spaces and the connections between them, and only noting the architectural detail. So it can be done discretely one just needs a notebook, and perhaps a camera, to capture the permeability plan. Replacing dots to represent rooms/spaces on the permeability diagram, with text boxes. This enabled me to add a name to the room numbers. Colour coding. This was mainly to enable me to distinguish different types of spaces, such as by the types of activity carried out there or by what floors of the building they were on. I interviewed a user of each of the buildings about what activities were carried out where in the space either while visiting the space or while looking at a sketch plan of the space. Treating spaces within rooms the same as rooms. Obviously the spaces are inter-visible with each other within the room unlike the situation between most rooms, but there are ‘walls’ and ‘doorways’ between these spaces created by furniture, by the people in the space and by the proximity to objects. For example, the block of seating in a lecture room can be defined as a space and that the access corridors as another. We sense that the space next to a lectern at a conference is a different space from that on the rest of the stage. We also sense locations not marked by objects but defined or respected by the movements and actions of people. For example a location from which a series of individuals take turn to speak. Clive Barker explored these spaces within spaces in great depth in theatre workshops that I attended as an undergraduate (for more details on these workshops see the Bodies and minds in space page), which he wrote about in his book on training actors (1977). (In addition following the movements, objects and directions of speech can reveal much as they play their part in expressing interactions with others and the ritual focus.) However, these ‘spaces’ are fluid as both can be re-located during the ritual or ignored by people, and I admit that there is some subjectivity with defining their extent and number. I applied this technique to spaces created within larger rooms. And it can also be applied to temporary spaces created outside, but here there are slightly different issues. The Druid group I studied are using a prehistoric stone circle. The stones of even the smallest circle are too wide and people gather within them so the stones do not define the main ritual space, but act as a permeable outer boundary. Those who do not wish to participate, and random visitors to this prehistoric site, watch from the stones, but see/hear very little as the cloaked people close enough to hold hands make almost a solid wall. The bodies of the main circle are both a barrier and a space. It is semi-permeable, people duck in and duck out, but it is mostly respected, as is entering the circle via the processional avenue of stones. The procession is lead from a tree which is used as the gathering point providing some shelter in the open field. Then the route is defined by an earthwork hollow and then an avenue of stones. The procession helps to both gather people together to commence the ritual, but also they move as a group and so it also help to create a sense of belonging to the group. It also provides a sense of spatial separation despite the fact the site is a wide open field. The main ritual space and the spaces within it are totally created by objects, actions and bodies. The four cardinal directions on the edge of the circle are marked by bearers of staffs and objects at their feet. They also turn outward and lead others in facing this direction. The centre is also marked with a few objects in the grass, but it is only used sparingly for key actions in the ritual. This minimal use of the centre is consistent with Barker’s observations in theatre. Also consistent with Barker, most of the actions taken by those who step forward from the group take place halfway between the centre and the edge, thus creating another space. This particular ritual space example is simple due to a number of limitations. This Druid group do not own the stone circle, are unable to permanently alter it and there is little time to set-up anything much before the ritual begins. As was an open ritual, many of the participants are not trained in Druidry and so do not know where to stand and what to do and without obvious architecture to guide them it is necessary to keep arrangements simple. “The main ritual spaces studied have the majority of their area devoted to visitor seating or standing. This creates an emphasis on communality. Participants gather together in large groups facing the same direction, toward the focus of the ritual space; indeed, in some cases (as in the Sikh Gurdwara), there is even a prohibition on turning your back on this space. Being together en masse in communal seating allows for synchronizing of movement and voice (Hillier and Hanson 1984, 191); as Marshall (2002) would put it, de-individuating and co-presencing the visitors to increase the sense of belonging. Between the visitors’ communal seating and the focus of the ritual space is a space where actions can be directed toward that focus. Significance is given to the actions by their close proximity to the ritual focus, and their high visibility in the area toward which all are looking. It is the point of closest approach for visitors to the ritual space focus. The ritual space focus is that point to which the visitors look, move, voice, and make actions. Also, as this space for actions is only occasionally used, it adds a sense of distance between the ritual space focus and the visitors, as well as heightening the significance of actions carried out there. Some people, of course, may have a temporary or permanent role separate from the group. This role may be indicated by a piece of furniture, such as a lectern or platform. “It has been noted by Renfrew and Bahn (2000, 406), among others, that ritual has both a “conspicuous public display” element, with the highest concentration of ornamentation being at the ritual space focus, and a “hidden mystery element,” or, as Nash (1997) described it, “restricted visual access.” Both of these seemingly “contradictory observations can apply to the ritual space focus in the same building. The role of ornamentation in aiding attention focus is obvious, but the role of hiding is less obvious. In all of the eight examples Hanks studied, the foci spend at least part of their time hidden by curtains or doors, hidden from view as a result of actions such as bowing or closing the eyes, or “hidden” by virtue of being an empty space. The decoration itself may be used to obscure or hide the object of the focus. Why? Hanks’s research leads him to suggest that it adds to the liminal nature of the ritual space focus by rendering it both seen and unseen. “Another part of a building’s function is the exclusion of strangers, which plays a particular role in preventing disruption of liturgical ritual. None of the examples in Hanks’s study has direct access from the outside to the main ritual space. Access is controlled by doors and bells, and is observed by cameras and windows. This increases the sense of separation from the ordinary world, in the same way that the ritual focus is also at the opposite end and at the deepest point in the permeability. More generally, there is “restricted visual access” from the outside, as has also been observed by Nash (1997) at prehistoric sites. This discourages strangers from visiting. One cannot see in, and the activity within is not on display; this is in contrast to visitor centers with their large windows and wide-open reception areas. The case studies which I looked I did do not have time to cover here, but the detailed notes and analysis will be added to this website on the case studies page. Only ‘Liturgical’ model has been published, rather than the details of the case studies that were the basis of the model. However, this model is only based on eight detailed case studies of different religions in Bristol, UK, in the 21st century. Figure 7. Rearrangement of Modes of Ritual table (Grimes 1982). The axis have been reversed and comments on power from Grimes have been added, excepting that on Celebration, which is my own suggestion. 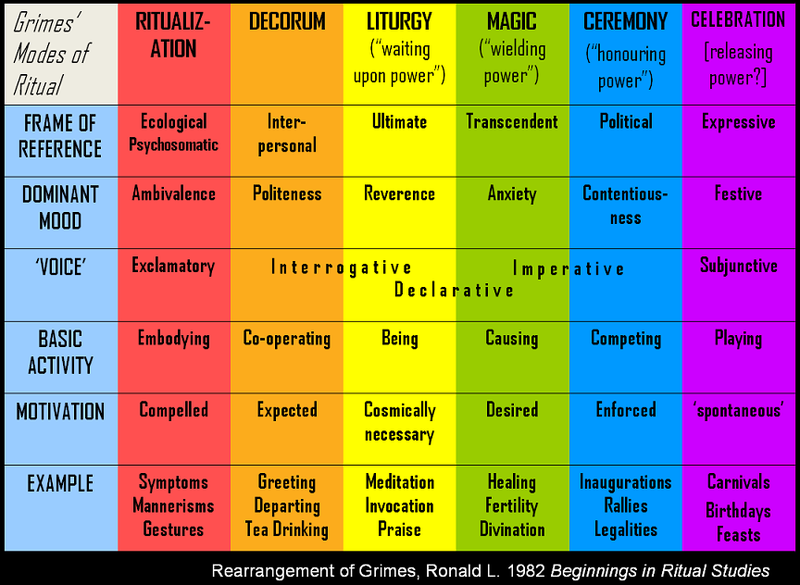 Above is Grimes diagram of the modes of ritual, which is the best description of the full range of ritual practice. All of the eight examples I looked at were in the liturgical mode (with a possible exception of the Druids). But what are the spatial features of other modes? Or do they have none at all? And then what are the spatial requirements for processional rituals such as the Abbots Bromley Horn Dance? Does this apply when the religion/beliefs are that of the majority in the area? All my cases were minorities in a general population of non-believers. Is the Stranger-Visitor dynamic, and the need to restrict physical and visual access from the outside weaker in these cases? Will the fact that much of the space is defined by action and not by any material left, make this approach usable in archaeology? Does this apply to other periods of time? If you do use the technique I have described here I would dearly like to see your permeability plans for the benefit of my own research, and I am happy to help with any questions you may have about applying the technique. But since writing the 2012 book chapter my ideas have developed further on webpages ‘Bodies and Minds in space’ (2014) and the ‘Thresholds of spaces’ (2013). Durkheim, Emile 1995  The Elementary Forms of Religious Life, trans. Karen E. Fields.New York: Free Press. Nash, George (ed) 1997 The Semiotics of Landscape: The Archaeology of the Mind. Oxford: BAR International Series 661. Turner, Victor 1967 The Forest of Symbols: Aspects of Ndembu Ritual. Ithaca & London: Cornell University Press.